According to legend, the lance holds sacred powers and the person who possesses it is thus invincible and capable of ruling the world. In ancient Rome, crucifixion was considered such an excruciating (from the word “crucify”) way to die that the Romans did not use it to execute their own citizens but rather reserved it as a form to torture and humiliate slaves, traitors and foreign criminals. The length of time for the condemned to die could range from hours to days depending on the condition of the person and the method of crucifixion. To hasten death and ensure that the crosses were empty by the day of the Sabbath, soldiers would often times shatter and crush the bones of the condemned with an iron club. However, when the Roman Centurion, Longinus, came upon Jesus, he noticed that he was already dead and refused to smash his bones. And to prove to all present that he had died, Longinus pierced Jesus’ side with a lance causing blood and water to flow from the wound and fulfilling the prophecy that the Messiah would die without broken bones and become resurrected. And so the legend begins. At the time Longinus encountered Jesus on the cross, he had long been suffering from a severe eye disease that nearly blinded him. This may explain why he was assigned to oversee the crucifixions. When he stabbed Jesus, some of Jesus’ blood and water fell into the soldier’s eyes, and he was instantly healed. According to Mark 15:39 he then exclaimed, “Indeed, this was the Son of God!” He was so taken by the miracle that he left the army, converted and became a monk. Eventually, however, in 45 AD, Longinus was beheaded for his beliefs. Years later the man who was said to have held, for one brief moment, the destiny of the world in his hands, was venerated as a saint. 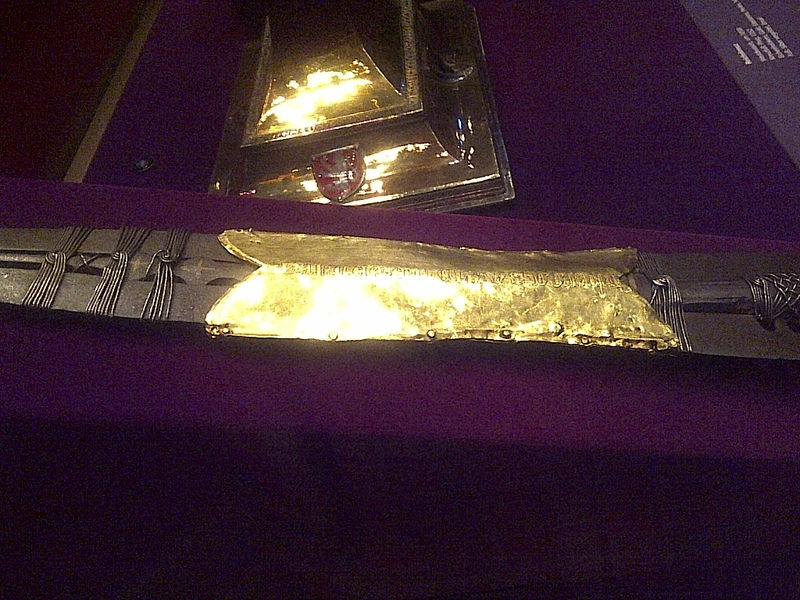 Somewhere along the line, the lance that had touched Jesus’ body and blood was passed into the hands of Maurice, the head of the 3rd century garrison of Roman soldiers who came from Thebes (Upper Egypt). In 287 Maximian, junior Roman Emperor, ordered Maurice and 6599 of his men to attack local Christians in a town in what is now Switzerland (today, St. Maurice-en-Valais), offer sacrifices to the pagan gods and pay homage to the emperor. Maurice and his men refused, and at first the emperor killed every 10th man to pressure the soldiers to obey. But when they still refused to follow orders, he ordered them all to be killed. The bravery and martyrdom of Maurice became legendary and Maurice later became a patron saint of the Holy Roman Emperors and the patron saint of soldiers, swords smiths, armies and infantrymen. For centuries, Holy Roman Emperors were anointed at his altar in St. Peter’s Basilica. From there, the lance eventually ended up with Constantine the Great, the first Roman Emperor to embrace Christianity in the early 4th century. Three centuries later Pope Leo III gave the lance as a gift to Charlemagne (742-814) , also known as Charles the Great, whose empire united most of Europe for the first time since the Roman Empire. Charlemagne is said to have carried the spear through 47 battles and died when he accidentally dropped it. German king Henry I, desperately wanted the lance as well and after doing everything in his power to get it, ended up acquiring it for a high price. On 15 March 933, on the day of St. Longinus, he conquered Hungary at the Battle of Riade with the lance and later successfully set his son, Otto I, spear in hand, to continue his reign. In 996, Otto III was so convinced of the lance’s sacred powers that during his march to Rome to reclaim the crown, he prominently displayed it in the front of his army. German Holy Roman Emperor, Frederick I Barbarossa, is also said to have possessed the lance and when he dropped the lance in a creek, his downfall was sealed. He’s the same king who is supposed to be sleeping in a cave in Bavaria somewhere, surrounded by his faithful knights, his red beard growing ever longer, waiting for the ravens to stop flying around the mountain so he can restore Germany to its former greatness. 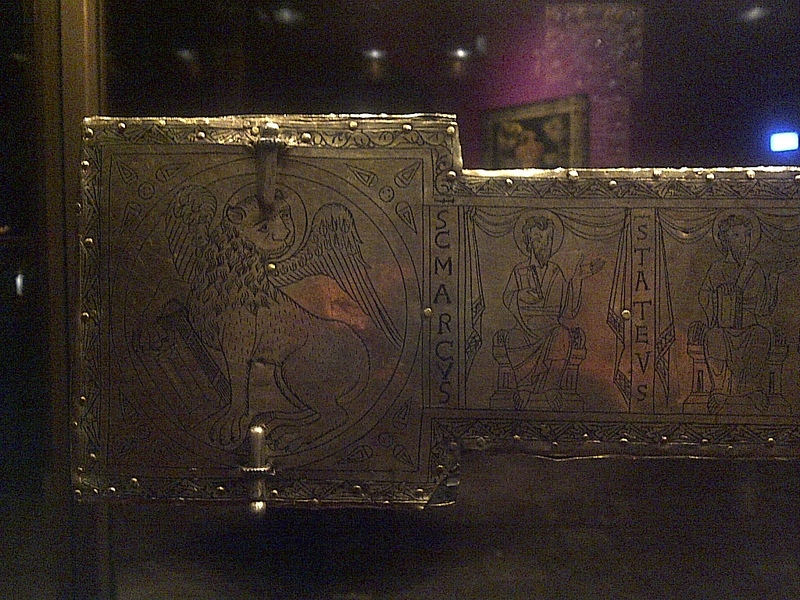 Around 1350 Charles IV had a golden sleeve put over the silver one and inscribed the words “Lancea et clavus Domini” (Lance and nail of the Lord). During WWII, after the annexation of Austria, Hitler ordered the lance and the rest of the Hapsburg treasury, moved to his spiritual headquarters in Nuremberg. US troops found the lance in tunnels in an underground vault and under US General George S. Patton, the lance was returned to Vienna. According to legend, they took possession of the lance on April 30, 1945 and less than two hours later, Adolf Hitler killed himself in a bunker in Berlin. 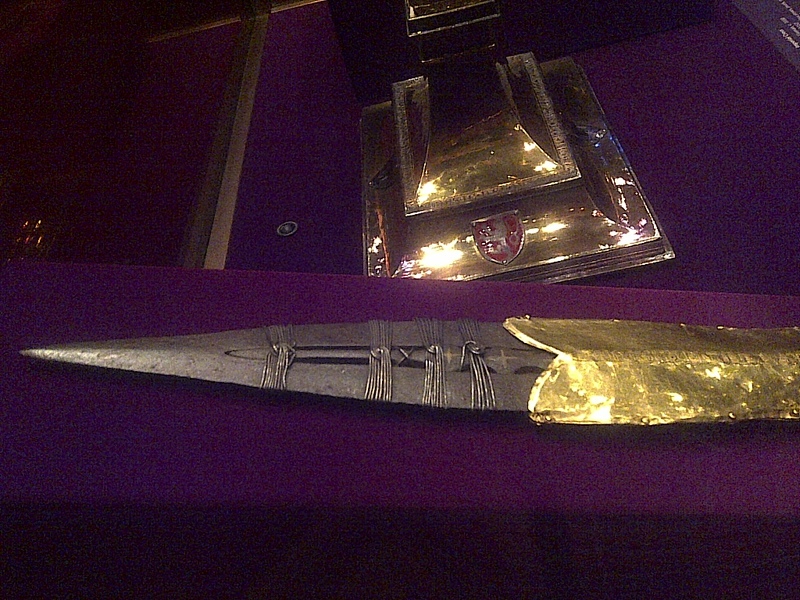 The lance is made of iron, is 50.7 cm long and was stored in the royal cross to keep it safe. The staff of the lance was wooden but can no longer be found. 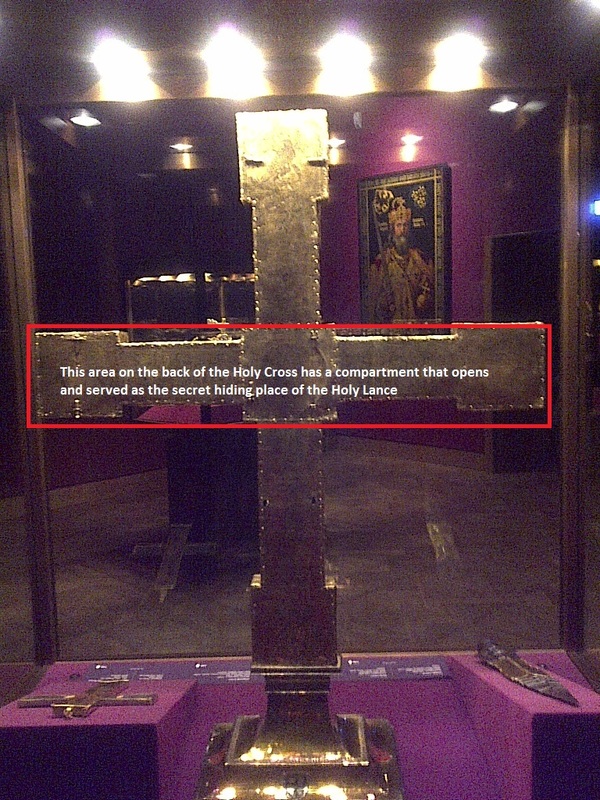 In 1914, Montan University in Leoben in Austria and in 2003, Dr. Robert Feather, an English metallurgist, both found that the holy lance probably dates back to the 7th century AD. Dr. Feather also confirms that the metal pin claimed to be the nail from the crucifixion is consistent with the length and shape with a 1st century AD Roman nail. And even if you don’t believe all the legends surrounding the lance, you cannot deny a sense of awe gazing upon an object that has witnessed 1200 years of history. 1200 years! And you’re looking at it. And maybe 1200 years from now, someone else, just like you, is gazing upon the exact same object. Awe-inspiring. Bouchal, Robert, and Gabriele Lukacs. Geheimnisvoller Da-Vinci-Code in Wien Verborgene Zeichen & Versteckte Botschaften. Wien: Pichler, 2009. Print. Kirchweger, Franz, ed. Die Heilige Lanze in Wien. 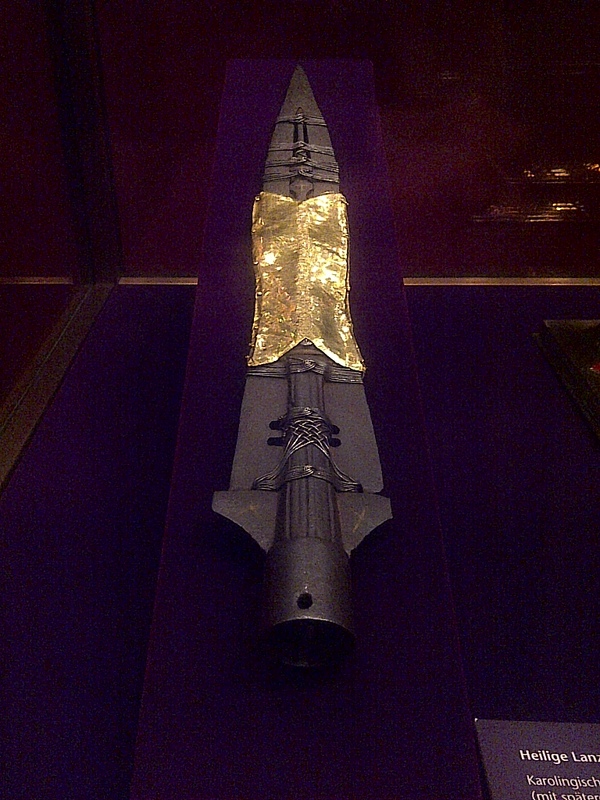 Insignie – Reliquie – Schicksalsspeer [The Holy Lance in Vienna. Insignia – Relic – Spear of Destiny]. Vienna: Kunsthistorisches Museum, 2005. Kirchweger, Franz. “Die Geschichte der Heiligen Lanze vom späteren Mittelalter bis zum Ende des Heiligen Römischen Reiches (1806) [The History of the Holy Lance from the Later Middle Ages to the End of the Holy Roman Empire (1806)].” Die Heilige Lanze in Wien. 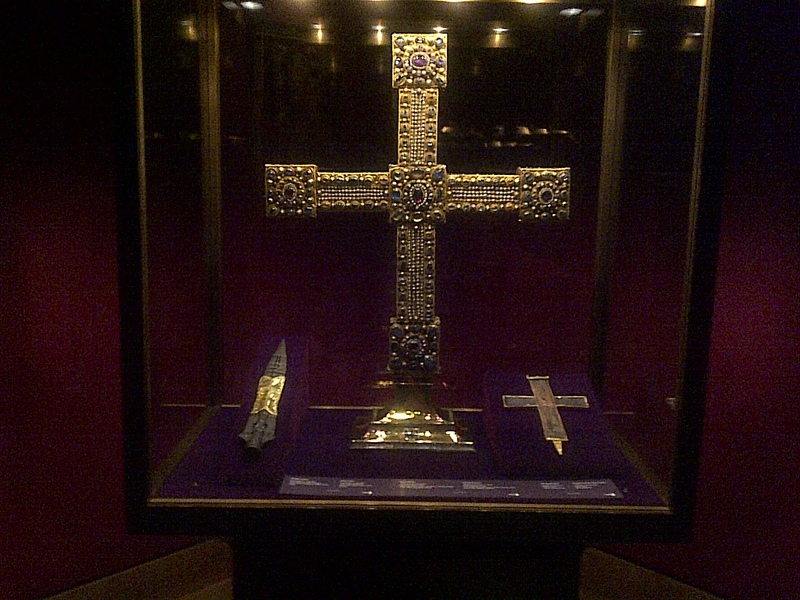 Insignie – Reliquie – Schicksalsspeer. Vienna: Kunsthistorisches Museum, 2005, 71–110. Ravenscroft, Trevor. The Spear of Destiny. [S.l. ]: Wehman, 1969. Print. ← It’s Sturm Time! Mahlzeit!